On a late fall Saturday morning in 1989 while sitting in the back seat of my Mom’s 1987 Ford Aerostar, as my knees, socks, and shin-guards were caked with mud, and my uniform was clinging to my skin with a mixture of both rain water and sweat, I laughed hard and smiled wide because I had just earned another shut-out. The Super Chargers were still undefeated. I was thrilled with our team’s win, but what made that moment so special was that both my brothers were going back and forth with each other rattling off highlights from the game. “You took that girl out, T!” Peter belted out from the way back seat behind me, patting my shoulders in the only way excited teenage boys know how, hard! “Yeah, and then you kicked the ball down the field before that girl even got up!” Tim chimed in from the front seat, while cranking his body back in my direction throwing up a high five. 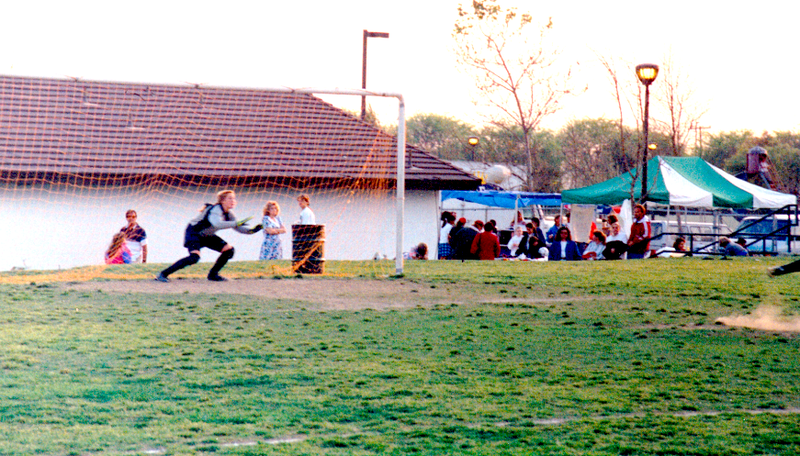 I was a goalie for much of my adolescence. Soccer was everything to me, and I was pretty good, but what gave me an edge was my confidence to charge out of the box and slide tackle players running toward the goal. I saved a lot of goals that way, but I missed quite a few, too. In every instance I followed my gut, which meant I minded the best angles, and hung back in the box if that was the best decision for the play. But when it was a break-a-way situation, I ran straight for the ball, and took out the player before she had a chance to shoot. The goalie position is stressful. I loved the feeling of saving a goal and shifting the momentum of the game, but walking back into the goal to fetch the ball from the net is a heavy feeling for a ten year old. Usually, my buzzing inner dialogue of how to prevent that from happening again usually drowned out the cheers from the opposing team, but the look of disappointment on my teammates faces branded me for life. I hated letting them down. I had a lot of time to think as a goalie. It is a lonely position. There is either A LOT going on, or nothing at all. I believe all of those lonely years in goal set me up well to maintain my focus in competitive situations; I observe, and then react. Actually, those are really good everyday life skills, too. What’s funny is I initially wanted to be a goalie because I didn’t like to run. A lot has changed since 1989. I love people, and have a general faith in the kindness of humanity, but I do love my alone time. This past Saturday I had a chasing the sun all day adventure that included an encounter that insured my belief that kindness is at the root of all of us. I had another brick work out on tap, and for the bike, I was prescribed to ride in an area with similar conditions to the Arizona racecourse, windy, dry, and fairly flat. My favorite place to do that is among the farmlands in Camarillo. Camarillo is a city about an hour drive north/west from my house, so with our days getting shorter, I needed to be up and out early in order to get everything in before the sun went down. This is how most Ironman triathlete's bedrooms look on long training days, filled with loved ones who miss us, but are used to the routine. My ride was cruising along as planned, but just after I pedaled back up from a fun/harrowing headwind battle along PCH, I was out of liquid and needed to visit the World’s Most Amazing Gas Station, the 76 station on Las Posas Rd. Unfortunately, just before I crossed the driveway of my mid-day oasis, I realized I was low on cash. Standing at the counter next to a gazillion dollar bike and being a few cents shy to buy a banana is quite humbling. It turned out I was about ninety cents short of covering my desired glycogen restoring loot. Thankfully, I had chatted with the clerk on a few other long rides the last few weeks, so just after I told him he could take away the banana, (I was not giving up the water and blue frosted Gatorade), he punched in his employee discount and was handing me back change. “No, wait, you don’t have to do that.” I pleaded. “It’s fine.” He replied in perfect Clark Kent demeanor. “Cool, I will be back. I promise!” I walked out with my heavenly elixirs and Harry Belefonte’s favorite fruit, downed them all quickly, and pedaled off toward the gorgeous shores of Point Hueneme. Next up was a two-hour run. Simone loves these all-day excursions. Port Hueneme is home to a Naval Base, and the Channel Islands sit just beyond the horizon. I passed through it years ago during a double metric century ride, and quickly on a couple of group rides earlier this year, but I had never run there, and running is still my favorite way to learn the lay of any land. The streets of Port Hueneme. The temperature was a comfy 74 degrees, but the winds still nagged like a wife asking her husband to put his dirty dishes in the dishwasher, natural, but annoying. The first hour was a meant to be at a mellow effort, which it was, but I was moving faster than I planned, so I decided not to push or pull it, but to just go with the flow. I carried a water bottle and stored my nutrition in my shorts, but honestly, why are there not more pockets on attractive running shorts? This pair had one pocket which uncomfortably fit two gels, but I needed more than that for a two hour run, so I secured another one inside my waistband and hoped for the best. I ran north along Ventura Rd. 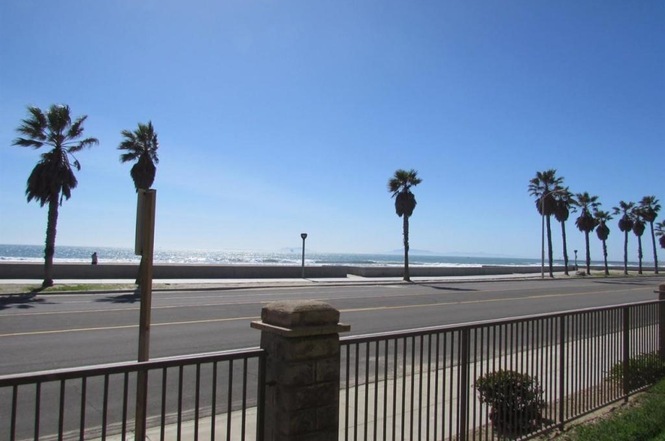 which a was pretty, tree-lined street, but after seeing a few families near the beach, it became obvious that most Port Hueneme residents are not used to sharing their roads with runners after 1 o’clock in the afternoon. A dozen honks later, I took their queue and hopped up to the sidewalk, which I loathe, but was the wise choice, except thirty minutes in, the sidewalk disappeared. I made a left at the next street, and ran west toward the ocean. Then I did a couple of loops around a less-trafficked neighborhood, and came upon a familiar building that I had not entered in over a decade. McDonald’s. I have been a vegetarian for nearly fifteen years, and strictly plant-based for about ten months, (I am not calling myself vegan because I still wear leather belts and shoes, fazing them out, but they are still in the rotation.) In any case, I prepare most of my own meals, I don’t eat fast food, and actually rarely eat any restaurant food at all. I ask a lot of my body these days, and she deserves the cleanest fuel in town. Bowls are a vital tool for a plant-based lifestyle. Therefore, I was not going to order a Big Mac at this golden arches location, but the timing was perfect to re-fill my water bottle for hour number two of my long run, the really fun one. I had just clicked over into mile seven when I started the second hour which was prescribed at Ironman race pace. I dipped down into that zone with relevant ease, but I felt it. I would tell you what that pace is, but I want to instill some level of intrigue with these posts, AND save some juice for my IMAZ race story. :) The key is that I wasn’t afraid to make that jump to the tougher effort, because I had faith in my fitness, and knew I would be fine. I kept my pace even until the last two miles, fourteen and fifteen. Since the run was almost over, and this time I felt like I could keep going at this pace for two more hours, I indulged my ego and opened up my stride to really run. Next, I cleaned myself up and strolled along the pier to take in the beautiful view, and capture the feeling of doing what I love most in the world. I still had a recovery swim to complete, but I had to make one quick stop on the way to the pool. Inside the "World's Greatest Gas Station." Isn't this place amazing? When I walked into the World’s Greatest Gas Station for the second time in one day, (this time monetarily prepared), I quickly noticed my favorite Good Samaritan was absent behind the counter. Bummer. Nevertheless, I was famished, so I grabbed water, Gatorade, and two bananas this time and strutted toward the register to properly pay for my post gigantic training day goodies. Just as I was turning to leave, my hero walked through the sliding front doors. “There he is!” I yelled out like an ecstatic Great Aunt who had just won the final game of Gin Rummy at her family reunion. “Uh, hi.” The lad replied with a confused smile. Mind you, I was not wearing my bike helmet or my slick Smashfest Queen cycling kit, www.smashfestqueen.com, so he might not have recognized the reeking tall lady in running shorts overzealously chirping at him as the rider in distress he rescued hours before. Hmm. On my drive home that night, after the ride, the run, and swim were complete, I reflected on all of the life I have lived with an athlete’s point of view. First as a soccer player, then a basketball player, (more on that another time), a runner, and now triathlete. I appreciate every second I get to be who I want to be. Except on that drive I realized that who I want to be, is who I’ve always been. What a gift to love who you truly are. I love this new song and video from the Killers. Enjoy.